The cottage yard work is almost done. The forecast for the next few days is beautiful. We'll spend the weekend there. Working on the gardens is the big project this weekend. I do expect to get a little sewing time in the mornings.... I'm kind of in between projects right now and I've been working on these posy wallets in the meantime. I'll bring them to the cottage with us today, and spend an hour or so working on them. They won't take long to finish now that the outside covers are all done. By the end of the weekend, I should have spruced up garden, and seven new posies to show you. I had a nice visit from my friend Carole C. yesterday. She travels and I travel and we haven't cross paths for a while. 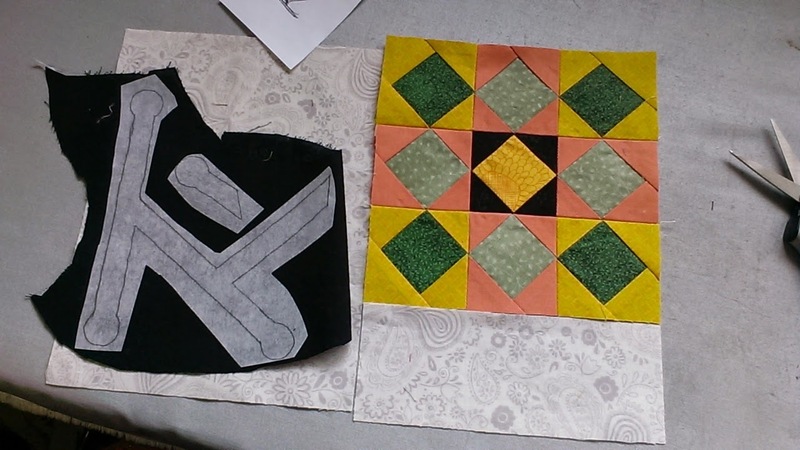 We had a nice visit and talked about how quilting has changed/progressed over the years. And she left me with an unexpected gift. It's a Tonga Treat. It's around 40 pieces of 10" x 10" gorgeous coordinated batiks. 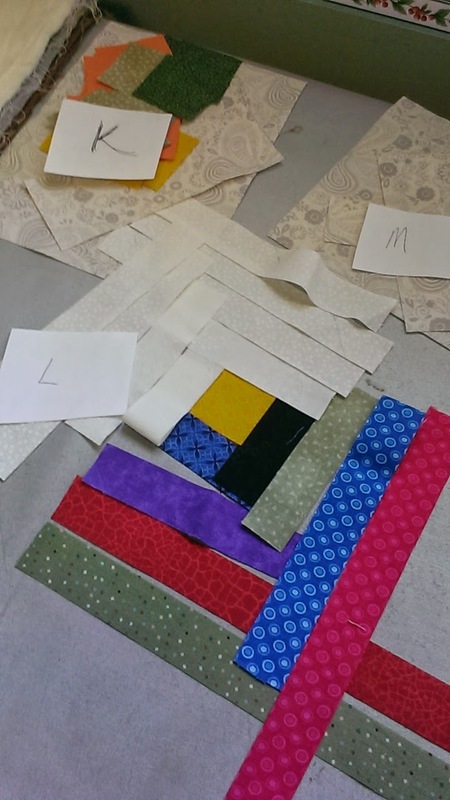 I'm going to look for a layer-cake pattern that will use every bit of these delicious fabrics. Do you have any suggestions? And don't you think that unexpected gifts are the best kind!!! With my KLM blocks way behind me now, I started working on my carrot project last Thursday. The project is a wallet. After looking in several stores for a particular style of wallet, I bought one. It had no coin keeper and I thought I could make it work. It wasn't long before I knew it wouldn't work and was on the hunt again. I was sick of looking in stores. I came across this wallet pattern a couple of weeks ago. I reviewed the pattern details very closely to make sure it would do and eventually bought it. What struck me about the Necessary Clutch besides the functionality, was the nice clasp/closure and the sturdy framing detail around the front flap. So subtle and professional looking. I was a little intimidated to install the twist lock closure, but it was one of the first things that you had to do on this pattern. And once that was behind me, it was clear sailing. Notice I didn't say smooth. I made 4 or 5 errors along the way, but that's because I was excited to get on to it and didn't read the directions carefully. I'll know better next time. Anyway, this wallet has room for 12 of my most used cards, a slot for bills or papers or coupons, a zippered section for coins etc. Most importantly it has room to carry my cell phone and my car keys. 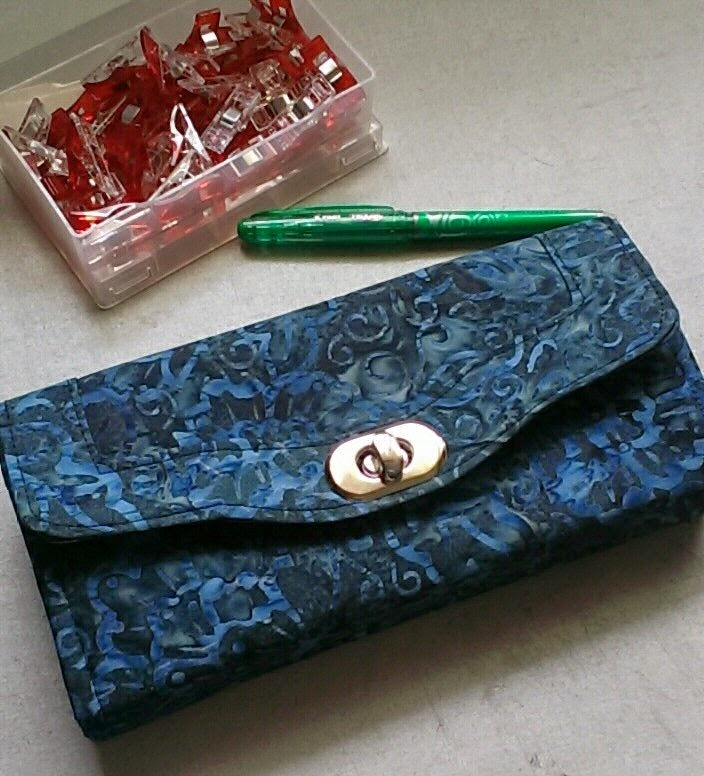 I only have a little bit of the blue batik fabric left and I'm going to try to piece enough together to make a wristlet strap that will clip on to one of the tabs under the flap. Now I'm happy with my wallet I think. I'll report back in a week or so. Next time you see me, ask to see my wallet. It's been a busy week so far. I've still not got my KLM blocks appliqued. And that means I have nothing to report on my "carrot" project. I have cleared tomorrow morning to do applique. But that doesn't mean that I haven't been doing anything. In between running errands and scheduled meetings, I've had pockets of time. 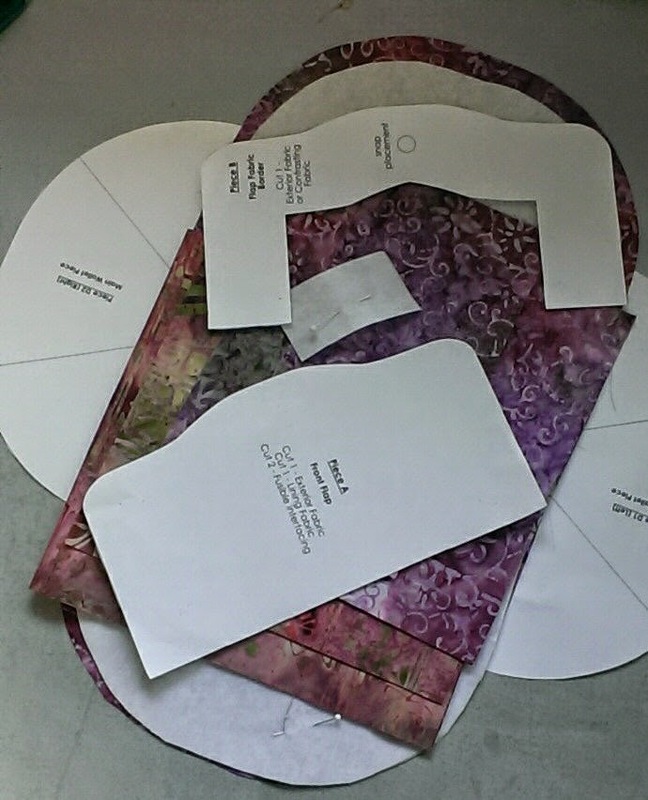 I decided to go through my scraps and pull out all the larger pieces and start cutting parts to make some posy wallets. 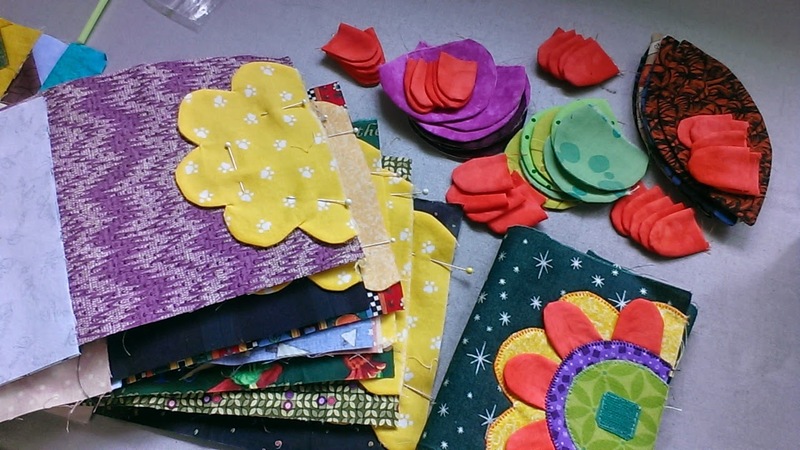 These posy wallets are perfect for people like hand quilters who go out to quilt. 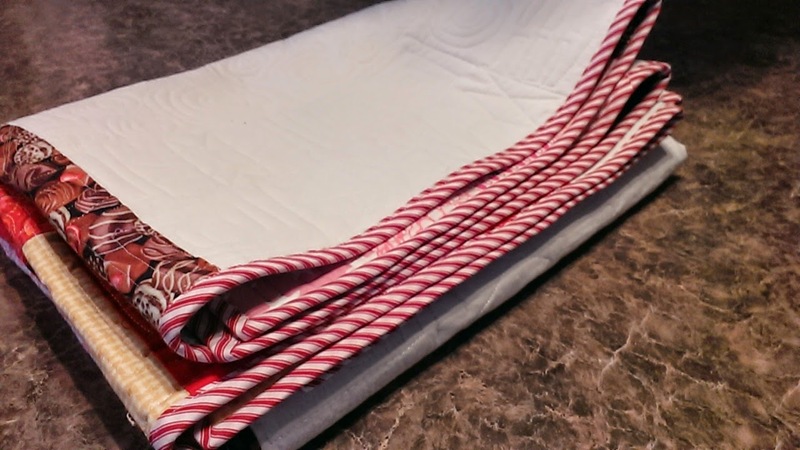 They take all their hand-quilting stuff with them all in a nice secure and cute package. While these wallets look simple, they are really friggy to make. So when I make them, I like to make a bunch. I enjoy using my scraps. In my mind, these cost me nothing to make. Just time. I need a couple for gifts and our guild's silent auction coming up soon, so I decided that it's good time to start picking through my scraps and prepare to make a few. 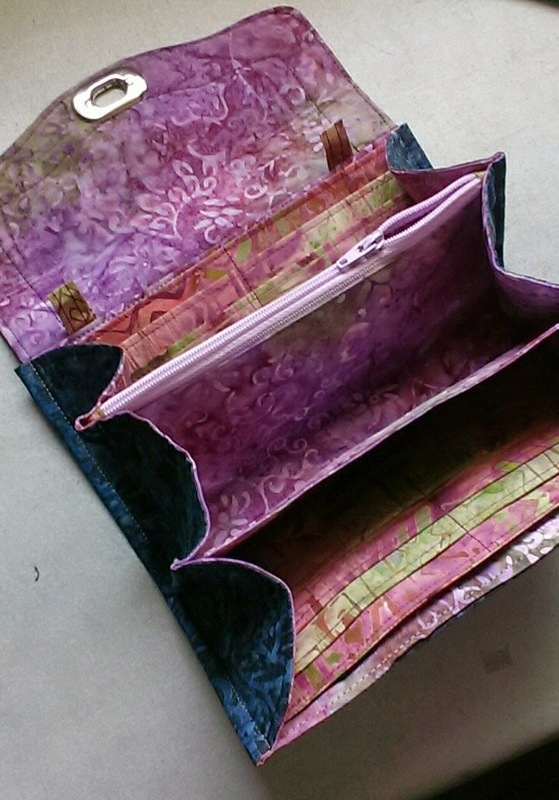 Each of these wallets has about 20 pieces of fabric. So I've picked and sorted and pressed and prepared enough scraps to make seven wallets... All my posy parts are ready. The plan is, next week, after my LMK blocks are appliqued, and after I've got a good handle on my "carrot" project, I'll start to assemble Posy Wallets. Sew, what sewing projects do you have lined up for the coming week? So with only the applique left to do on the K L and M blocks I'm getting excited to start my carrot project. In fact as a small reward for getting my KLM blocks almost done, I decided I would cut out the pieces for my carrot project. But be assured that sewing on it will not begin until my applique is done. Despite the overcast and drizzly weather, we'll be at the cottage today and tomorrow. Opening day at the cottage means crawling around the ground to get the pipes closed up so that the water can be turned on. Then all the inside work consists of hanging curtains, washing out appliances and cupboards, making beds, and a zillion other things. One thing I need to do soon is decide which sewing machine will be left at the cottage this year. I bought a new small Pfaff last year. I call it my workshop machine. But since I don't do any workshops in the summer, I might try it at the cottage. That will take the pressure off my trusted old Pfaff 1471 from the 70's. Fun stories from around the Quilt Frame! On Wednesday afternoons I go hand quilting at the church. Today we were 7 around the frame. It just warms my heart to have a big crowd. 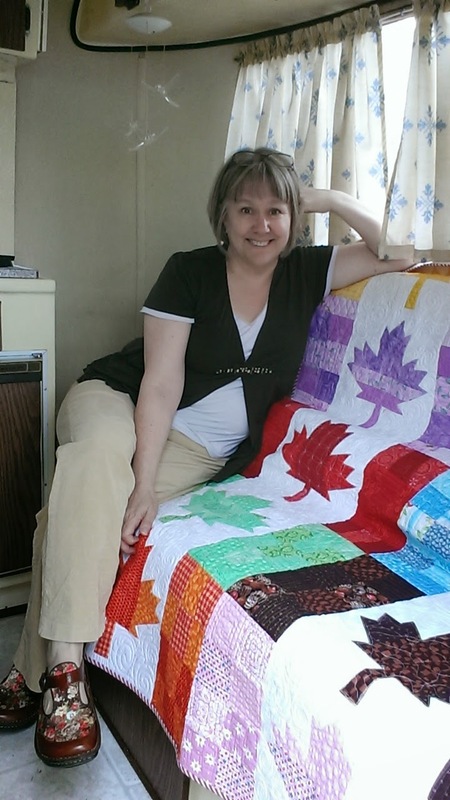 If you have ever been part of a hand quilting group you know that everyone has stories. Our group tells stories from the old days. Today, we laughed and laughed. They talked about all the ways that women tried to curl their hair. From wrapping your hair with cloth bits and some even wrapped their locks around crumpled paper. Each one had stories about pin curls and then came the day of the perms... They called them Toni's and those little curlers that look like bones. I have some of those by the way!! Then how they had brush curlers, foam curlers and such. Each one had a bigger and better story!! We laughed all afternoon. Then the conversation turned to bloomers and nylons. Not me, but almost everyone else talked about getting bloomers for Christmas. For the most part the were an awful blue! Some of these gals said that during the depression, women painted a black line on the back of their leg so it would appear that they were wearing nylons. What stories do you hear around your frame? For my Block of the Month project, I've had my three May blocks cut out for a week or so. But I find I'm having a hard time to get at sewing them up. 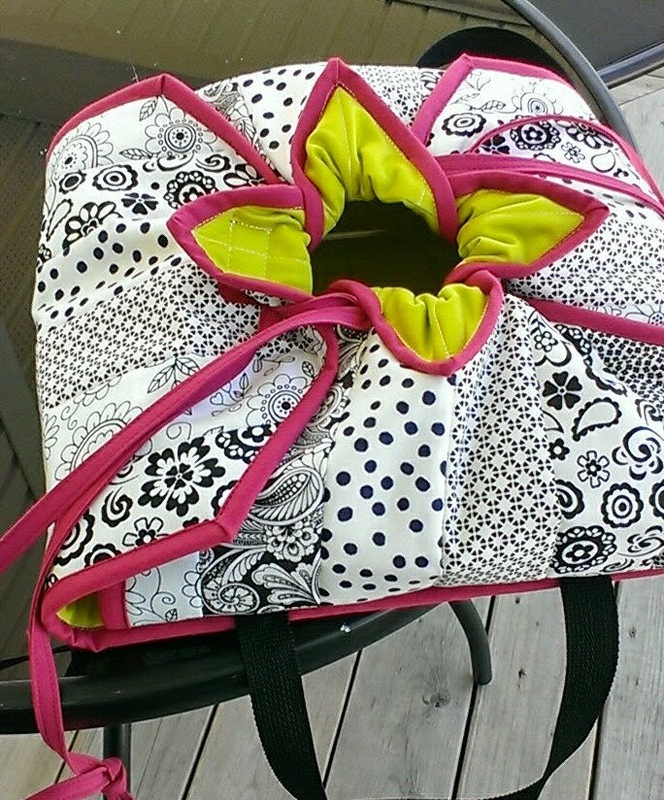 Other projects, like the casserole carrier earlier this week, seem to be more interesting. So I made a pact with myself. I'll do my three blocks this week, and when I'm done, I get to start working on my new small project. I bought the pattern already. I've rummaged through my fabric and will make a practice one. It'll be my carrot, so to speak. So, with the dangling of a carrot in front of me, I'm looking forward to getting my 3 blocks done for the month of May. Today, I'm working on the K block. That Kansas star block has 40 pieces and it's only 8" big. Well the hard work is done on that block, so it'll be a quick finish, tomorrow that is. Maybe, I'll get the "L" block done too. I can't wait to start my new project. It's small, and functional, but a little complicated. I'm sure it'll take me a week to finish. I'll show you once I get going on it.... I know when you see it, you'll want to make one too. It was at last month's guild meeting when I saw this casserole carrier at show and tell. 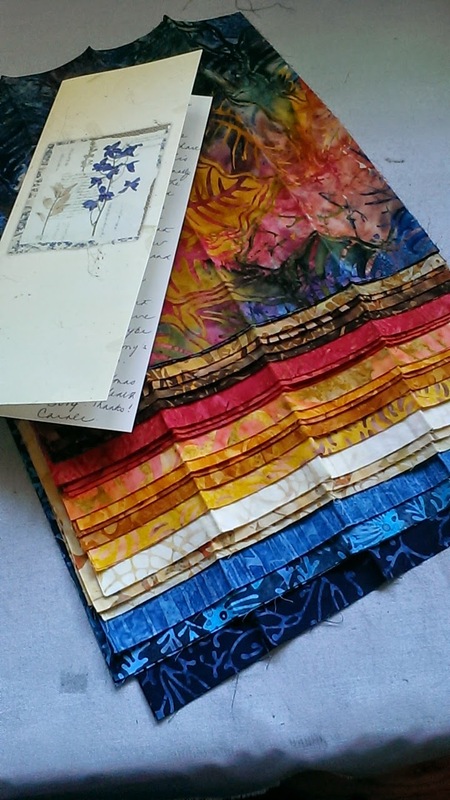 Fellow guild member Anne, had made two of them out of gorgeous batiks. I came across the pattern in Nova Scotia last week and thought it was meant to be. I bought the pattern and couldn't wait to make up a prototype. That's what I've been working on this week. I used left over black and white strips, and leftover green and pink fabric. Quite the color combo, eh.. It's finished, but it's too big for my 9" x 9" casserole pan. I will look to see if I can find a slightly bigger casserole dish. Or maybe one with a cover. I like the carrier but would rather it fit my dish a little more snugly. I will use it one way or another when I go to our guild's annual pot luck next week though. Maybe I will try the size for my 9 x 13 pan next. Myself and Donna checking out the Boler. 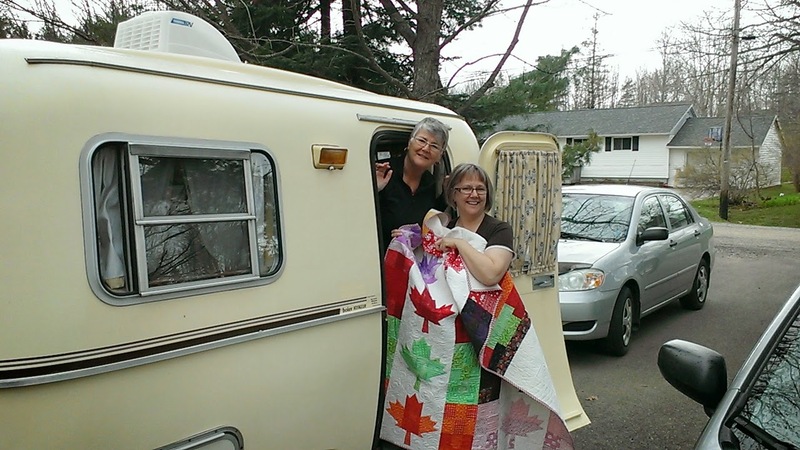 My sister loves the quilt especially made for her "new to her Boler". It's a sweet vintage Canadian made trailer. Its fiberglass and looks small on the outside, but it's quite roomy and comfortable on the inside. They are planning their maiden trip in the Boler on May long weekend. Once she has been out a few times in the trailer, she will stock it with the essential space efficient necessities. She plans to re-decorate the trailer over time once she knows what she needs. Happy Camping!! My sister's Canada Day Quilt is done.. The quilt I'm making for my sister is done. It's on its way to Nova Scotia with us today. 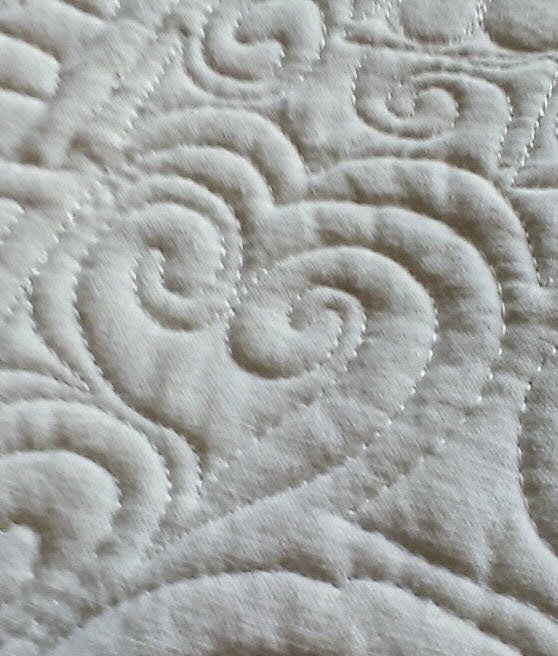 I'll share a couple of lessons I learned while machine quilting it. 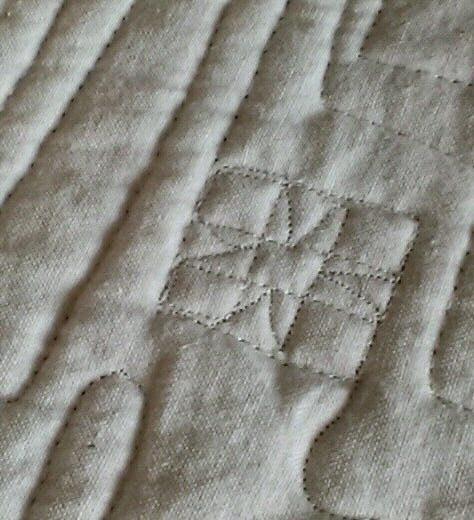 The first lesson is that I should always pin excess backing to the front of the quilt while machine quilting. It's hard to see, but the line line where where the backing got folded under and I didn't realize it. I didn't bother to pick it out. It's quilted in quite nicely!! This is not the first time it's happened to me. Second, I should have known better, but I thought I would save time by using a slightly faster binding method. I usually always use my tried and true method using my Pfaff bi-level foot. 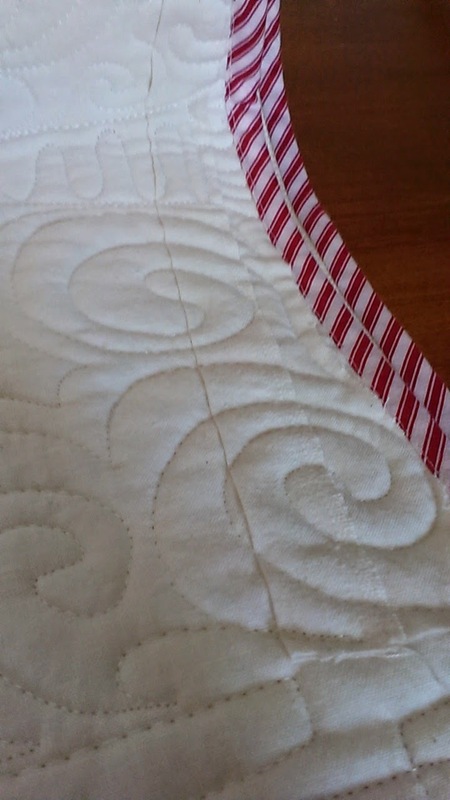 But yesterday I thought to save time, I'll use another method where you sew the binding on the front of the quilt, fold it over, pin and stitch in the ditch, and hope that the edge of the binding catches in the seam on the back. Well, even after pinning very carefully, I had 15 small sections in the back where the binding was not stitched down. I ended up spending a half an hour, re-pinning and re-stitching. So, I spent more time at the binding after all. A one inch star block among the swirls. Can you draw this without going over a line twice? I won't show you the front of the quilt right now for two reasons. It looks the same as the one made for myself and I posted last July 1st and I want my sister to see it first. 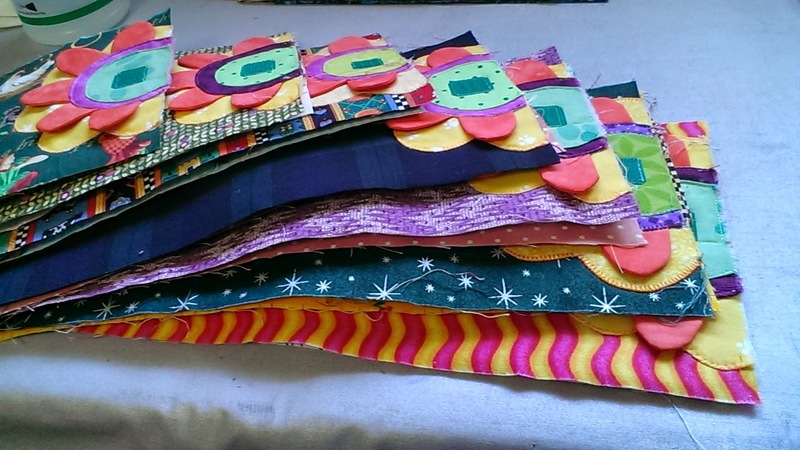 I'll show you a couple of pictures of the whimzy quilting on the back though. I've added a few little quilted I spy motifs for my sister. I wonder if she will be able to find them. All folded and ready for the little boler trailer.